My apologies moderators for my "POINTLESS VERBIAGE". Luckily scientists will continue to do great work, like grow the first plant on different world, while you do the ever so important job of moderating the hollowed comment section of this fine website. This is a critical experiment & needs to be repeated, dozens of times. Not just on the Moon but also in a variety of orbits. The truly exciting, earth-shaking results are when this cotton plant seeds & those seeds also sprout. Even if they have ti be fertilized ny hand. Growing true over a sequence of generations. Perhaps it may need a series of reinforcing stock from Earth, in order to thrive? Was it the lunar soil? 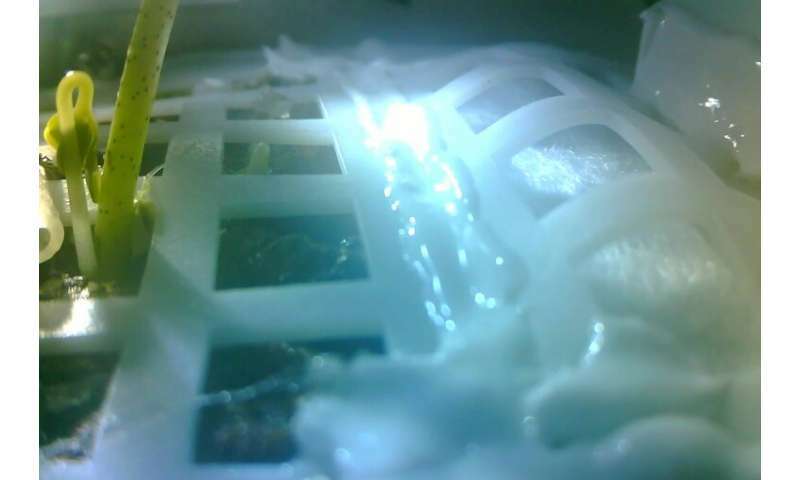 Did the plant grow in the open space in lunar vacuum or inside a gas chamber? Was the light artificial or Solar? If answers to all above questions are negative, this lunar-biosphere experiment could also have been done in a vacuum lab with lunar g on earth in a much cheaper way. Wait...am I sensing the deceptive nature of this new Chinese claim? It looks like to me that people are reading a lot more into what was actually said. "who designed the "mini lunar biosphere" experiment—sent an 18-centimetre (seven-inch) bucket-like container holding air, water and soil." Notice air, water and soil. The air and water had to come from the Earth, and there isn't anything in the statement that said they took the soil from the moon, so there is no reason to believe that is what was done. People seem to want to run before they walk, doing any "growing experiment" is useful if nothing more than looking at the effects for that kind of radiation and probably not that expensive given that the rover was going there anyways for other purposes. This is a "why not" experiement. It was ALL PREPACKAGED before it left Earth. And it is in an ENCLOSED environment that is only somewhat similar to Earth's environment/climate. It hasn't been outside of the lander so that it is almost in a protective "cocoon". It would be interesting to see what would happen to the sprout if the enclosure was opened to allow the Moon's atmosphere in. Frankly, I feel a bit sorry for the fruit flies. The other seeds might just be late bloomers. Anything is possible with the Communist Chinese - their scientists AND politicians are of a different culture and ethics so that what they do on the far side of the Moon can only be guessed at by American, Japanese and European scientists and politicians. After they have accomplished their experiments - what will they do next? What will they plan to send to that far side - after all is said and done? Possibly something nefarious and deadly to the US? The Chinese are desperate about their population. They are exporting their people to other countries to dilute the problem at home. They are taking over huge operations (a kind of latter-day colonialism) such as mining in Africa. Food security research makes sense for them. That gonna work at night? Night is 14 days long on the Moon. Expecting that seeds will not germinate on the Moon if given proper air, water, and soil is stupid. So much for trying to prevent contamination of the environment of the moon from earth microbes! doesn't the rest of the world decontaminate their spacecraft to protect the Moon and other Planets? The authors forgot that agreement while stumbling all over themselves trying to show s how wonderful the Chinese form of dictatorship is. Errr, there's no air on the Moon. They're doing this on the far side of the moon because part of what they are doing they want to keep secret. But also the near-side had already been reached by US astronauts so that the science of that "half" had been "checked out" by our side, and Moonrocks brought back. The puzzler is that the NASA seemed to give up on its ambitions to continue more manned Moon missions after the last one in the 1970s while giving the hardware as an excuse not to go back. There was also the "conspiracy theory" allegedly told by an astronaut that they were warned to not go back to the Moon, and that one of the astronauts had seen what resembled "structures and ships" on the Moon's surface. Who knows whether it was true or not? But if true, then it is possible that future Chinese astronauts to the Moon just might encounter something living there. I hope - for their sake that it is just a conspiracy theory. as Frank Sinatra says, with a straight face "please be true"